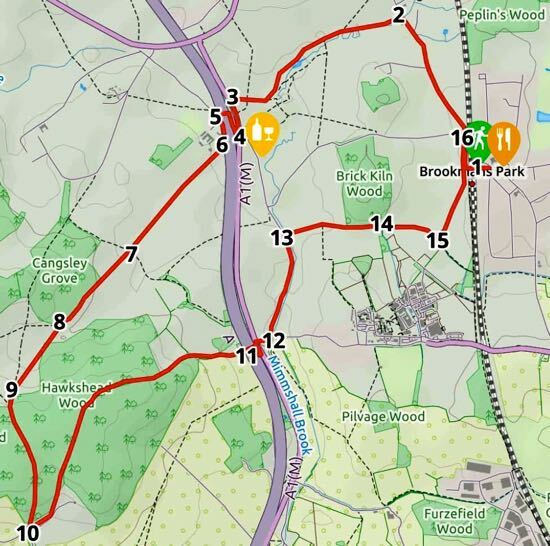 This is a really good hill walk that you can do starting and finishing in Brookmans Park village. 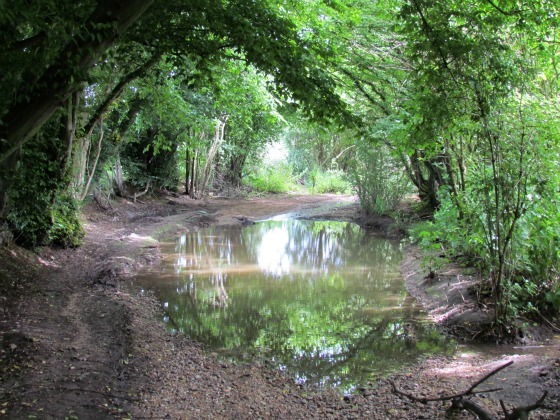 At one point it follows an old coaching road from South Mimms to North Mymms, crossing the secluded Potwells valley. There is a short part that is alongside the A1(M), but it is soon over. Look out for the old oaks and the remains of the windpump along Love Lane. Head west out of Brookmans Park along Station Road crossing the railway bridge and heading north past the Potterells Medical Centre and on towards the Catholic church. Just before the church, and immediately after crossing a small stream, take the footpath on the left and head west along the edge of the field. Keep following the path (which eventually becomes North Mymms footpath 8) and continue with the hedge on your left and the field on your right until you emerge on Swanland Road. Turn left and walk a short distance until you come to the garage on your left. If you want refreshments you can turn left at this point and pop into The Woodman Inn at Water End. At this point cross the road and head for the bridleway on the other side of Swanland Road. The sign points to a footbridge over the A1(M). This is North Mymms bridleway 82). After crossing the bridge the bridleway makes its way down to the lane. Here you head south alongside the west side of the A1(M) along a byway open to all traffic (North Mymms BOAT 5). Continue until you reach a paved track on your right heading south-west (North Mymms bridleway 1). Turn right and follow this bridleway south-west. You will reach a bridleway/footpath crossing, but you continue straight on along the bridleway, which can be overgrown with nettles in the summer. This bridleway leads up to Cangsley Grove. Look out for a gate on the left leading south-west across an open field. Take this footpath (North Mymms footpath 1) across the first field, cross a small wooden footbridge and continue south-west across the next field, eventually emerging on a bridleway (North Mymms bridleway 2). Turn left on this bridleway and continue along the ridge between North Mymms and South Mimms, eventually dropping down to Woodhill Farm. At this point turn sharp left and follow the byway (Ridge restricted byway 11 which soon becomes North Mymms restricted byway 3) and head north-west through Mymmshall Wood and Hawkshead Wood eventually reaching a footbridge over the A1(M). Cross the motorway and follow the path round until you reach Swanland Road. Cross Swanland Road and go down the lane leading down to a small road bridge over Mimmshall Brook. When you reach this bridge don't go over it, but, instead turn left and continue along Warrengate Road with the houses on your left and Mimmshall Brook on your right. After passing the waterworks on your right, look out for a footpath sign on your right marked Station Road (North Mymms footpath 11). Here you cross the brook on a footbridge (look out for kingfishers). This path becomes a boardwalk for a short stretch and then continues as a footpath called Wise's Lane. 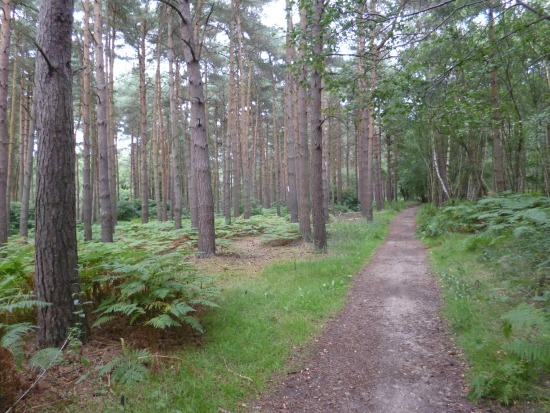 Ignore the first path off to your right and continue straight, passing Brick Kiln Wood on your left. At the end of this path you will come to a gate. Turn right, cross a footbridge and then turn left and follow this path alongside the edge of the field until you reach a gate. After going through the gate turn left, cross another footbridge, veer left and then right and follow the footpath (North Mymms footpath 9) until it reaches Station Road. Turn right, cross Station Road and head back to Brookmans Park.